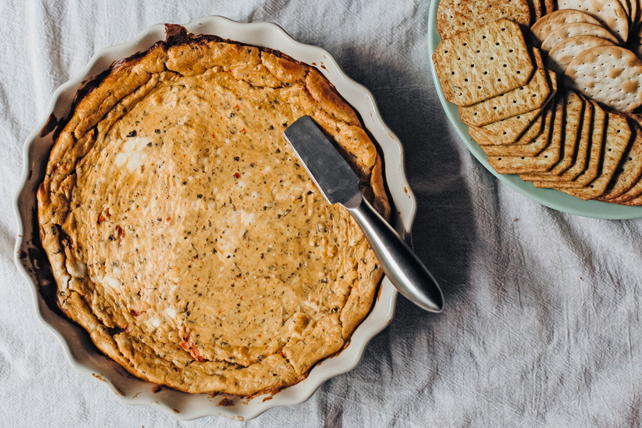 Three kinds of cheese, flavourful pesto and puréed roasted red peppers are the reason this spread is so rich, cheesy and divine on a cracker. Beat cream cheese and ricotta in medium bowl with mixer until blended. Add eggs, 1 at a time, mixing well after each addition. Add remaining ingredients; mix well. Pour into 9-inch pie plate. Bake 50 min. or until centre is almost set. Cool completely. Cover. Refrigerate 4 hours. Let stand at room temperature 15 min. before serving to soften slightly. Serve with assorted crisp crackers. Baked spread can be refrigerated up to 24 hours before serving.